Jack Pearce praised his hard-working Rocks team for getting back in the Bostik premier play-off zone – but insisted: It’s a miracle we’re winning so many games. The Bognor manager warned it was going to be tough to sustain form that had brought four wins in six games as injury problems mounted. Pleasure at Saturday’s 2-0 victory at Burgess Hill, where two Jimmy Muitt goals earned the points that moved the Rocks up to fifth spot, was tempered by long-term injuries suffered by centre-half Gary Charman and loanee midfielder Theo Widdrington. Charman fractured his shoulder and could miss the rest of the season. Incredibly he is the fourth centre-half the club have lost to a long-term injury this season. They have seen Keaton Wood ruled out since September – and he faces at least another three weeks out – with an ankle injury, while Corey Heath has been out since August, also with an ankle problem, and is only just feeling his way back to fitness. In addition Pompey youngster Joe Dandy played just two Rocks games before returning to Fratton Park injured, and has not played since. Widdrington tore his hamstring at Burgess Hill and won’t play again for the Rocks before his present loan spell runs out at the end of the month. The possibility of a new loan when he is fit may be explored. And Pearce and coach Robbie Blake have full-back Calvin Davies more than a month away from his return after knee trouble. The frustrated manager said: “It’s unbelievable, it really is. “We have had absolutely no luck with injuries at all this season – especially centre-halves. “What fans have to realise is injured players still have to be paid. 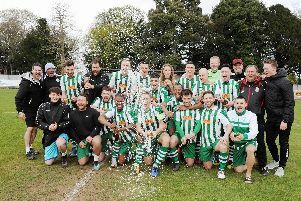 There is not an inexhaustable supply of players wanting to play for Bognor, nor is there an inexhaustable amount of money to pay players and keep bringing more in. “Because of our injury situation it’s another week where I’m ringing round clubs and contacts seeing if anyone can do us a favour. “We need to replace players who are injured but it is very, very difficult to keep doing it. Pearce praised Muitt for a rich vein of scoring form that has seen him score five in their past four games, taking his league total to the season to 13. But he maintained his view that fans should not get carried away with the team’s achievement of reaching the top five. “We’ve played better in a number of home games that we’ve lost this season than we have in some of the recent games we’ve won. The Rocks host 17th-placed Potters Bar on Saturday and are at home to East Grinstead in the last eight of the Sussex Senior Cup on Tuesday. Left-back Joe Tomlinson will not be permitted to play in the county cup game because he is a Brighton player. Pearce is in touch with Pompey again this week to check on the availability of strikers Brad Lethbridge and Dan Smith, and whether midfielder Freddie Read or winger Leon Maloney – who both played at Burgess Hill – will be free to feature again.